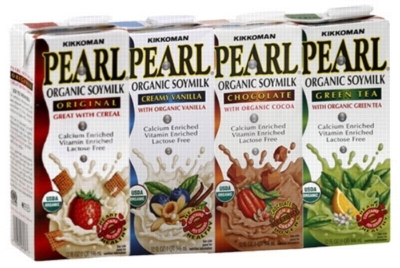 Pick your favorite assortment of these delicious and organic soy milks! Original: Drink it by the glass, pour it over your cereal, make it the cream in your Chai latte, and so much more! This organic, original flavored Soymilk has a smooth taste and texture and makes a great lactose substitute! Green Tea: The perfect blend of the sweet and light refreshment of Green Tea blended smoothly with the rich texture of soymilk. Packed with antioxidants, in addition to Soymilks own health benefits, this blend is both delicious and extra nutritious! Chocolate: No chocolate or soy aficionado will want to pass on this delightfully rich blend. Two different imported Dutch process cocoas are added to the organic soymilk to provide a blend with just the right amount of sweet, a depth of smooth cocoa flavor, and the health benefits to make this an indulgence you can feel good about.